Philly Bird Nerd : Adirondacks Part 2 - Lifer! 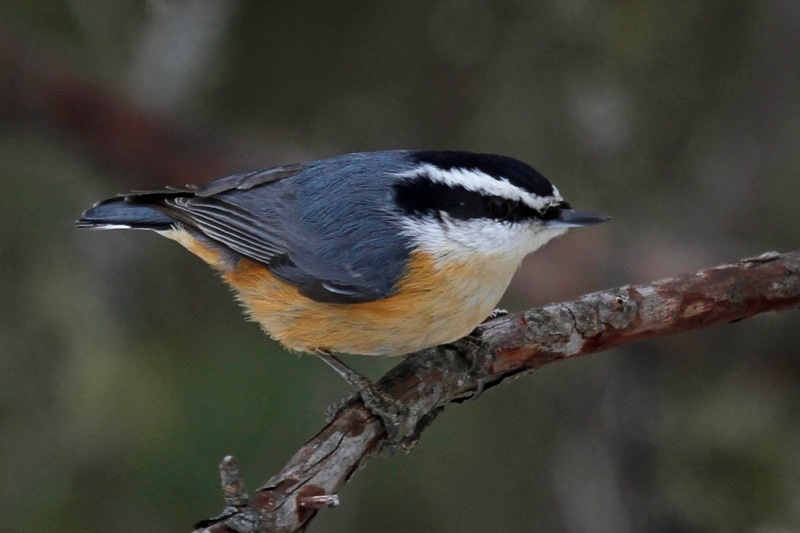 The attraction of birding the Adirondacks in winter is to see boreal species. We got the Gray Jay on Saturday despite having a dozen snowmobilers whiz by and other people walking their dogs off leash. We missed some of the other boreal species I suspect due to this commotion. We decided to head back to Bloomingdale Bog first thing on Sunday morning despite the looming weather forecast. We were out the door at 5 AM and traveled through snow storms to arrive at the bog by 7 AM. Good news - no snowmobile or dog tracks in the fresh snow. We were the first people there. Brandon got a tip about the location of Black-backed Woodpeckers just up the road so we started there. It took Big Daddy Alyssa (AKA Cupcake) about 4 minutes to spot the bird! It was hammering away at a tree right beside the road. Unbelievable. We all oggled it and snapped some photos when here comes a huge snow plow. We thought it was the end of our encounter but that little sucker stayed put. 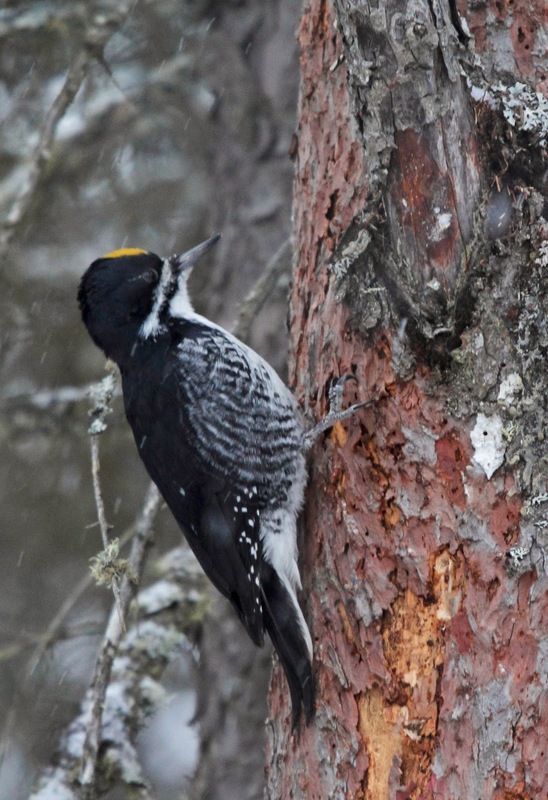 A few things to note about this woodpecker. First, it has a solid black back (hence, the name). Second, it has a yellow cap. Most woodpeckers have red caps. Appropriately, the third fact is that this woodpecker only has 3 toes. Most woodpeckers have 4 toes. All of these ID traits can be seen in the photo below. It is really difficult to get a photo that is in focus of a woodpecker when they are pecking. Here is a video which is pretty good and shows the little guy at work. Check it out. We headed back into the bog trail to try our luck with Spruce Grouse and Boreal Chickadee but came up short. Who cares. We saw a Black-backed Woodpecker! And the Gray Jays cheerily met us along the path again. We fed them cinnamon buns. Oh, and a few more cuties like this Red-breasted Nuthatch. 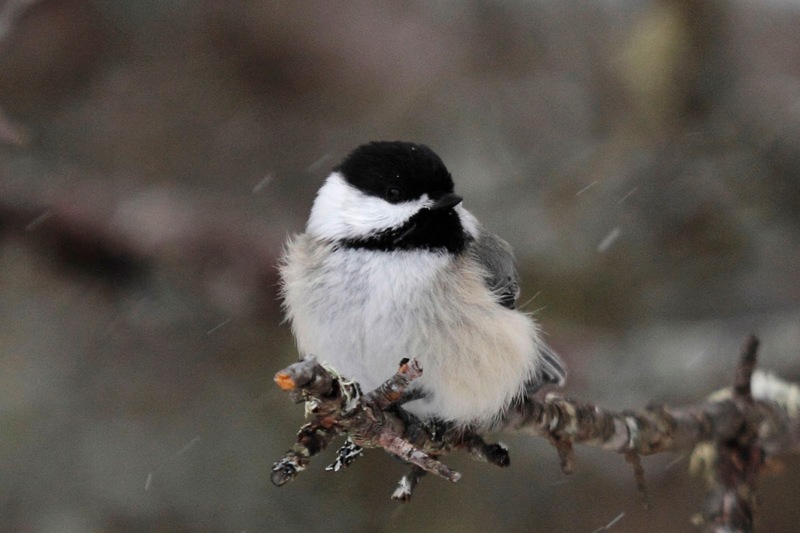 And this Black-capped Chickadee posing with snowflakes streaking by. 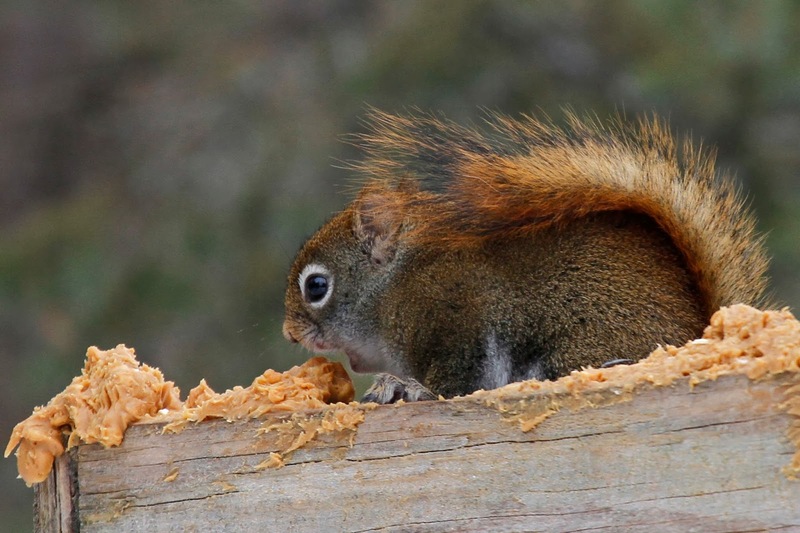 And this adorable Red Squirrel chowing down on the yummy peanut butter that was slathered on the feeder. Zoom in and you can see his little mouth getting ready to chomp on the peanut butter. We were a happy group for sure. Here is the gang. That's Sam on the left, Alyssa in the pink hat and Brandon with the giant grin. Of course, yours truly has a dopey look as usual. It was a great trip even though our total list was shorter than usual.